The Feed Melbourne Appeal was launched in 2009 by Leader Community News, Melbourne’s largest and most influential community newspaper publisher, and FareShare, a charity that rescues surplus, quality food and cooks it into nutritious free meals in Australia’s largest charity kitchen. These meals are delivered to food relief charities – such as soup vans, homeless shelters, food banks and school breakfast programs. A charity that rescues surplus, quality food and cooks it into nutritious free meals in Australia’s largest charity kitchen. 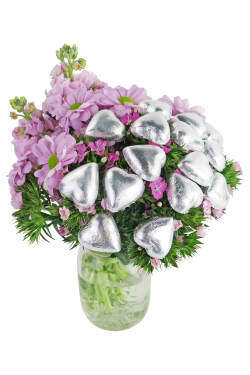 An arrangement that is Full of Love and you might find a sweet surprise of food hiding amongst the beautiful blooms! Each month more than 140,000 Victorians struggle to put a meal on the table at times, and they turn to community food charities for help. This is the ‘hidden hunger’ in our community. Rather than create another food relief charity, Feed Melbourne works to raise funds to help support the hundreds of established ones, and over the past 10 years, the Feed Melbourne Appeal, has raised enough money for more than 8 million meals. In 2018 they aim to raise enough money provide 2 million meals and have set themselves the audacious goal of raising enough to provide 10 million meals per year by 2028.